Rangers manager Mark Warburton says his team must learn from a narrow victory over Hibernian. James Tavernier's fine free-kick proved decisive, but with better finishing Hibs could have drawn level at Ibrox. "It would be too easy to say 'three points, thanks very much,' and move on," said Warburton. "I thought we were loose and made some poor decisions. "We didn't take care in the final third. But we will learn from it and be a better team for it." 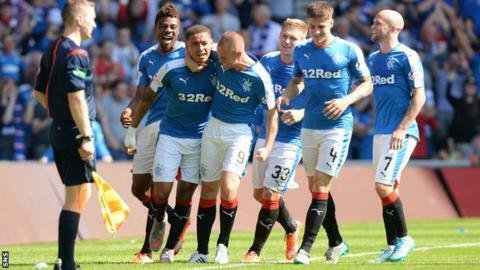 The triumph over their Championship rivals extended Rangers' excellent start to the season - and Warburton's reign - to six matches. "Whether you beat the top of the table or the bottom of the table team it is just three points," added the manager. "And you have to recognise that we fell below the level at certain times today. We have to analyse that and that is the beauty of this squad, they are keen to do that. Describing Tavernier's strike, which arrowed in over Hibs goalkeeper Mark Oxley from wide on the left, as "tremendous", Warburton revealed 18-year-old midfielder Gedion Zelalem, who has joined on loan from Arsenal, will commence training with his new teammates on Monday. "He was watching the game today in the stand," he said. "He will be training with us tomorrow and will be part of the squad. "I am delighted to get hold of him. I would like to welcome him on board. He is another young, very talented player." Meanwhile, Hibs counterpart Alan Stubbs left Ibrox wondering how his side emerged pointless after creating "six or seven" chances. Jason Cummings and Liam Henderson, in particular, passed up huge opportunities to find the net. "For long periods of the game we did very well and how we have not scored is frustrating, especially after creating the clear chances that we did," said Stubbs. "And when you look at it, that's the difference between winning and losing games. "I thought our game plan was working really well. We frustrated them but goals change games and we had good chances when it was 0-0 and you have to take them. You have to be clinical." Stubbs understood why Dylan McGeouch, signed from Celtic this week after a loan spell at Easter Road last season, was aggrieved to be punished for a hand-ball by referee Steven McLean for the free-kick which Tavernier converted. He said: "I can see why. It is very difficult sometimes to get out of the way of a ball coming at you at speed. "It is a bit harsh but you will find that some referees give them and some don't."